Hotel Catalonia Avinyó, Barcelona. Catalonia Avinyó Hotel Barcelona. Enjoy convenience and comfort in Barcelona's Gothic Quarter at the Hotel Catalonia Avinyó. The hotel is within walking distance of the Plaza Sant Jaume, near all the attractions of Barcelona, and with the dynamic, inspiring and attractive neighborhood of El Born, where the best bars, restaurants and shops await you. The building itself is a surprise. Although its exterior isn't showy, the minimalist, simple and sober interior will take you to another place far from the city bustle. We have the recipe you need: a rooftop pool, from which you will enjoy inspiring views of the neighborhood. To give you energy for new adventures, we also offer a delicious breakfast every morning with fresh pastries, cheeses, sausages, light products, juices and the ever-present potato omelet or the traditional bread with tomatoes: the Mediterranean wishes you good morning! For intimate moments, come to the hotel bar with their sandwiches and snacks, and don't forget that you can rely on free Wi-Fi. 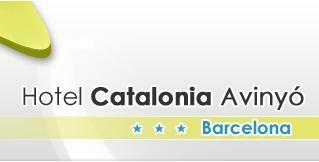 Hotel Catalonia Avinyó: an unforgettable stay in the heart of Barcelona.